There’s a feline expression for pretty near everything you might come across on your cat-skiing journey. Catnip, the nibbly treats they keep in the snowcat while you’re skiing. Catgut, which occurs when you eat too much of their delicious food. Kitty litter, the snowballs tossed up by the blades of the snowcat that make stopping in a hurry tricky business. And, of course, cat-a-logs — the really nice wideopen runs you only get in clear-cuts. Maybe, but as the ones who get to jump out and ski away, we feel even luckier. With a skiable terrain of almost 2,500 hectares and average runs this day of about 350 vertical metres, the powder between the heavily loaded snow ghosts is knee-deep and very sweet. Kelly wields her machine nimbly around a corner in the snow road, a corner only she can see, disguised in an all-white blanket of whiteout as it is. Communicating by radio, a few moments later she waves to Libby, at the helm of Princess II, as they rumble past each other in the field. Big flakes are now chucking down. 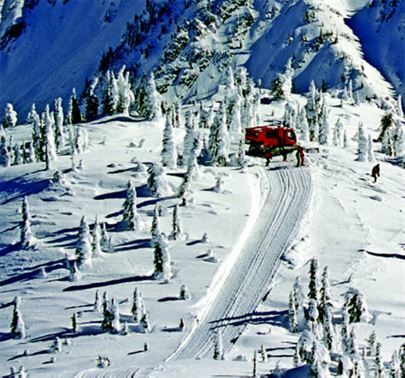 Powder Cowboy is all that’s great about B.C. backcountry skiing. Its terrain is wild and heavily treed. Its dude-ranch lodge is rustic yet decidedly cool. Its staff is winningly warm and friendly. And it snows here like stink. The Siliconers displayed no evidence of dif?culties decoding the Cranbrook dialect and the day of? cially began. After a short drive to the staging area and a thorough transceiver practice, Kyle and Darcy, our lead guide (also a Crannie boy), led us into the ?rst of many untouched light-as-air powder glades we would ski that day. Through the soup of a low-cloud layer, Darcy pointed out where the Lizard Range—and Powder Cowboy’s more famous corporate cousin, Island Lake Lodge—sits about a kilometre or two to the east. The two cat operations, as well as Mica Heli Guides, are owned by the same company. I asked Darcy about the difference, if any, between the two operations. “We’re home-style over here,” he declared proudly. “The Island Lake guys are the fashion boys.” He made the no-pretensions point by surreptitiously playing a killer rendition of “Smoke on the Water” on his Avalung. The Siliconers didn’t appear to notice the most famous four-chord riff in rock-and-roll history that’s reverberating through the fir trees around them with delight. I followed the kazoo-tunes through the glades, with the powder washing up over my thighs. The cowboy moniker certainly makes sense down at the lodge. Driving in from the highway, ? rst you have to hunt behind an old sawmill (Powder Cowboy has yet to gain permission for proper signage), then hack your way 17 km up a pretty hairy logging road. We arrived, expecting banjos at the ready, and instead found charming log cabins heated with pot-belly stoves, a beautiful lodge with a funky open kitchen, wireless access, stables with horses, llamas, goats— and a genuine Powder Cowboy welcome. As our day continued, we racked up a satisfying dozen runs. On the last cat-crawl down to the pickup, over a ?nal catnip of snacks and drinks, we chatted about the perfect powder and the comfort of cat riding. Just about then, despite the ambient warmth inside the cabin, I noticed my derriere was feeling cold—and wet. Sitting next to me, fast asleep with his drink now spilled over my pants, my darling tree buddy, Karl, had added a new word to the lexicon. After a long day of riding like cowboys, we all deserved a good catnap. 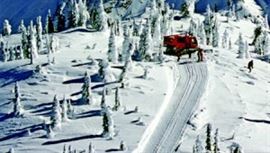 SNOW AND TERRAIN: Powder Cowboy’s 2,500 hectares of terrain receives an average snowfall is almost 900 cm. Each day, guests get 8 to 14 runs, about 3,000-4,000 vertical metres of bowls, open slopes and tree-skiing, with the longest run 762 vertical metres. CAPACITY: 12 guests and 2 guides for each of two snowcats. ACCOMMODATION: Guests stay at the Bull River Guest Ranch, consisting of 8 guest cabins, a hot tubs and sauna cabin, and the Big Horn Saloon with dining room, bar and massage rooms. PACKAGES: $952 for 2 days, low season only; $1,785-$2,025 for 3 days; $2,380 to $2,700 for 4 days. Prices include all meals, accommodation and powder ski/board rental.